Last night I found myself at my old stomping ground – the public library. Back in the day, I introduced films at the library’s weekly classic film night. (I still do it sometimes but that’s a different story.) When I saw that Nothing Sacred, a 1937 screwball comedy starring Carole Lombard was the classic film night’s selection, I had to check it out. I had never seen this movie before and curiosity got the best of me. 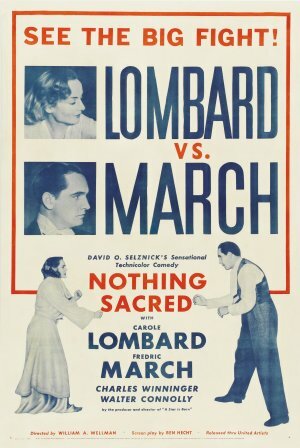 Nothing Sacred is not only the first screwball comedy filmed in color, but also Lombard’s only Technicolor film. Like so many other movies before and after it, Nothing Sacred shows the lengths journalists will go to get a story. Hazel’s seemingly fast-approaching demise makes her a beloved public figure and tabloid sensation. Reporters and photographers follow her every move. She is seduced by the attention but also knows that she can’t live with her lie forever. This is why I found watching Nothing Sacred this week in particular to be especially striking. The movie offers a commentary on over the top media frenzy that can be translated to today’s celebrity obsessed culture. Even though Nothing Sacred has no real connection to Friday’s royal wedding, the movie tapped into my many misgivings about the days media hoopla and my relationship to it all. My biggest problem with the royal wedding is this. I wasn’t alive to witness Prince Charles’ and Princess Diana’s 1981 nuptials that so many people reminisce about. My mother, for instance, thinks it is exciting to watch their son get married 30 years later. No, I don’t really associate the words “fairy tale” with what is taking place this Friday because I clearly remember when Princess Diana died. That is my main childhood memory of the royal family and not an extravagant wedding celebration. Realizing this makes it hard for me to fully embrace the royal wedding fever. Yet I’m still going to watch because at the end of the day I’m just as engrossed in celebrity culture as much as the next person. This is sort of the moral of Nothing Sacred. (Like how I brought this musing full circle?) No matter what Hazel did and how far out of control her story was spun, people still watched and cared about her every move.